Just Great Acoustic Guitars – Whilst we dearly love our vintage electrics here at JGG, we also keep a keen eye out for great acoustic guitars that have that ‘something special’ about them. These are the guitars that you just can’t put down once you start playing them. We have four particularly fine acoustics in stock right now, ranging from a gorgeous Gibson B-25 from 1967, a stunning Martin HD-28 32 Shenandoah, a Gretsch New Yorker from 1958 and also an absolutely incredible Gallagher G-70 which comes with a custom fitted hard case. These guitars represent some of America’s finest guitar builders and the quality and craftsmanship is really second to none. All are highly responsive instruments with excellent playability and truly unique tones, whether you play with a pick or your fingers. 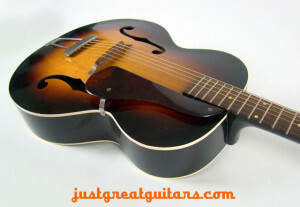 So, regardless of whether you are a singer-songwriter looking for the perfect acoustic instrument to accompany yourself, a finger style soloist or a pro sideman who needs great playability and excellent tone night after night, we have something here for you at JGG with these incredible acoustic guitars. Click on any of the pictures here for more information on any of these guitars, or feel free to get in touch with us directly for friendly expert advice on choosing the acoustic guitar of your dreams.